Another year has come and gone, and quickly at that. All in all, it was a pretty good year. We moved into our dream home in January and have been enjoying all of the "firsts" we share here; first holidays, first garden, first paint jobs, first leaking roof (well maybe we didn't enjoy that one). We've met some great people since we've moved in and we are so glad we finally have a place to call home. This past summer, Joel and I were reminded how much fun we could have on a road trip when we drove up to New Hampshire and Maine for a long weekend. This was also the year I tried to kick myself back into shape. I started running more regularly and traveled to Erie, PA in the fall to run a half marathon with a friend. Perhaps the most exciting thing that happened to our families this year was when our nephew Parker was born in August and our niece Lucia was born in October! While it was a great year, I am eagerly looking forward to 2013 to see what new things it will bring! As I've done the last few years, I want to share with you my favorite dishes that Joel and I enjoyed throughout the months this year. What were your favorites? JANUARY: Roast Beef, Arugula, & Shaved Parmesan Sandwich with Garlic Aioli. This simple sandwich was one Joel picked and we couldn't have been happier. We've enjoyed it many times throughout the course of the year. FEBRUARY: Vanilla Creme Brûlée for Two. We aren't much for celebrating Valentine's day. We opted to stay home and make a nice meal, complete with this dessert. We were both stunned by the results! 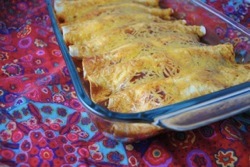 MARCH: Butternut Squash Enchiladas. Dubbed "magic" enchiladas by my sister-in-law. I think that name says it all. APRIL: Spinach & Artichoke Stuffed Portobellos. You can't go wrong with a giant, creamy, stuffed mushroom! MAY: French Macarons with Nutella Buttercream. What a fancy cookie. An intricate process, but totally worth it! JUNE: Rajas Poblanas. Joel took the wheels and posted a series of guest posts, which he kicked off with this quick and delicious meal. JULY: Mocha Granola. I loved this, but Joel didn't really eat any. Bonus-the one and only picture of mine to be accepted to Tastespotting! 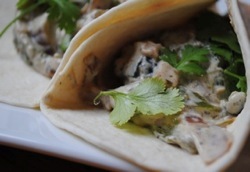 AUGUST: Spiced Black Bean, Grilled Avocado, & Goat Cheese Tacos. A Pinterest find, and a very quick and easy meal. SEPTEMBER: Grilled Garlic & Herb Bread. A concoction created entirely by Joel to use up some of our garden's herbs. We've enjoyed this many times since. OCTOBER: Apple Cider Bread Pudding with Salted Caramel Sauce. My first post for First on the First. What a delicious new group to be a part of! NOVEMBER: Ad Hock's Chicken Pot Pie. We've both developed a little foodie crush on Thomas Keller. Everything about this dish was amazing. We are looking forward to many more of his meals with our ever-growing TK cookbook collection! DECEMBER: Momofuku Chicken & Egg. I enjoyed this at David Chang's restaurant in Toronto, and since have enjoyed it twice at home. Simple and delicious!